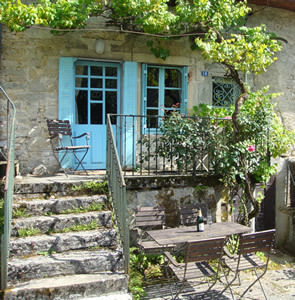 Maison McDonald is a beautiful, relaxed French hide-away, full of character. It has a kitchen/living room and a comfortable sitting room, which leads out to a balcony. It sleeps up to 7 adults in three spacious bedrooms, all with exposed beams. Two are doubles and one has two double beds in it. Attractive kitchen/living area with original flour press and baker's table. Exceptionally well-equipped kitchen with a fridge-freezer, cooker, dishwasher, microwave and washing machine. All the smaller items such as a blender, food processor and coffee machine are provided, too, so you can cook and bake to your heart's content. At the rear of the kitchen is a comfortable sitting area with a small sofa, an antique pine dresser and an easy-to-use Godin wood burning stove. Bedroom two is light and spacious with a double bed and a child's single bed. It has exposed beams and a pictureque view. The second bathroom is next to this room. Bedroom three is on the second floor and has two double beds. There is a children's table with two chairs and a bookcase of mainly children's books. The travelling cot and high chair are currently to be found here. The second bathroom has a hand basin, WC and a bath with a shower over it. There is a pretty garden at the rear with steamer chairs and shady trees so that you can relax with a view of the stream, the reculee and very often the donkeys can be seen nearby. There is a barbecue here, too. The rear balcony is perfect for leisurely breakfasts and some of our guests stay here all day reading and soaking up the wonderful scenery. The small balcony at the front overlooks the paved terrace with its table, chairs and barbecue. The rear balcony and garden enjoys this spectacular view.